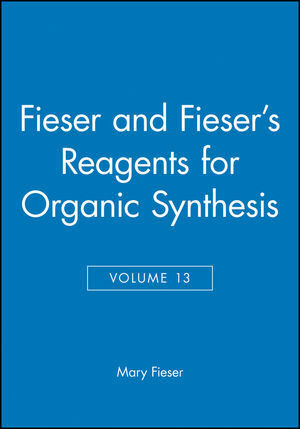 Reagents for Organic Synthesis This widely respected reference has been brought up to date with the publication of Volume 13. Thousands of entries abstract the most important information on commonly used reagents from 1966 through mid-1986. Every reagent discussed includes the preparation, uses, sources of supply, critical comments, references, and more.Volume 119671,475 pp.Volume 21969538 pp.Volume 31972401 pp.Volume 41974660 pp.Volume 51975864 pp.Volume 61977765 pp.Volume 71979487 pp.Volume 81980602 pp.Volume 91981596 pp.Volume 101982528 pp.Volume 111984669 pp.Volume 121986643 pp. About the authors Mary Fieser received her formal education at Bryn Mawr and Radcliffe. Since then, she has been active with her husband in research and writing. 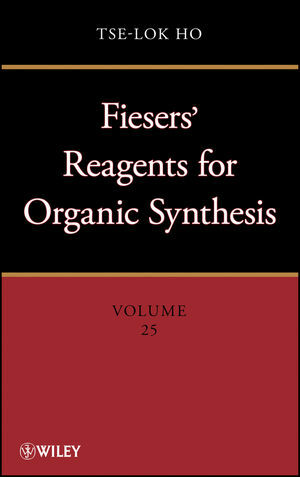 Their numerous books include Organic Chemistry, which was translated into ten languages, and Steroids, of which four editions have been published. Mrs. Fieser has received the DSc (honorary) degree from Smith and from Mount Holyoke, and the Garvin Medal of the American Chemical Society. Janice G. Smith received her education at Cornell and Harvard. She is currently Professor of Chemistry at Mount Holyoke College, with particular emphasis in synthesis.